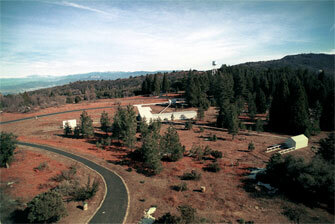 The Palomar Testbed Interferometer (PTI) was funded by NASA to demonstrate technology for ground-based interferometry. Light collected by three small telescopes in the three small buildings is directed through pipes to the central beam combining building. The separation among the three telescopes is 110 meters. This image shows the outside of one of the small buildings housing one of the interferometer's telescopes. In the background is the central beam combining building, and behind that, the Palomar 200-inch telescope. Light from the two telescopes enters through the two white pipes shown, and is directed down the long tunnel to optical delay lines which move under computer control along precision tracks. Light from the delay lines is then reflected back toward the optical table in the center of the picture, which contains additional optics, and then is directed toward two beam combiner tables on either side of the picture. The beam combiner tables are essentially the 'cameras' of the interferometer. The gold dewar contains the infrared detector which measures the interference of light collected by the two telescopes. Other optics are used for tracking, metrology, and calibration. The location of the maximim of interference tells the scientist about the location of the celestial object, while the strength of the interference provides information about the size and structure of the object. The interior of one of the small buildings showing to the left a gimbal which steers a flat 0.5-meter mirror (the mirror cover is on) to direct starlight into the telescope, which is shown pointing at the gimbal, angled down at 15 degrees. Light from the telescope is directed to the central beam combining building.